← Thinking about college? Minnesota colleges rank well. The name Chanhassen comes from the a Dakota word meaning sugar maple tree and at this time of year you can see how it earned its name. It’s gorgeous here among the lakes; there are twelve beautiful, clean lakes, wholly or partially located within the city limits: Christmas Lake, Harrison Lake, Lake Ann, Lake Lucy, Lake Minnewashta, Lake Riley, Lake St. Joe, Lake Susan, Lotus Lake, Rice Lake, Rice Marsh Lake, and Silver Lake. It is home to the Minnesota Landscape Arboretum and the largest professional dinner theater in the US (The Chanhassen Dinner Theatre). There’s really something for everyone – outdoor enthusiasts and culture buffs alike. In 2015, Chanhassen was named #7 top places to live by Money Magazine – in fact they have made the list five of the last ten years. In 2007, they received Family Circle Magazine’s award for being one the Top Ten Towns to Raise a Family. IN 2014, Chanhassen was named number one in the National Research Center’s “Voice of the People” awards in the following categories: Safety, Natural Environment, Built Environment and Recreation and Wellness. 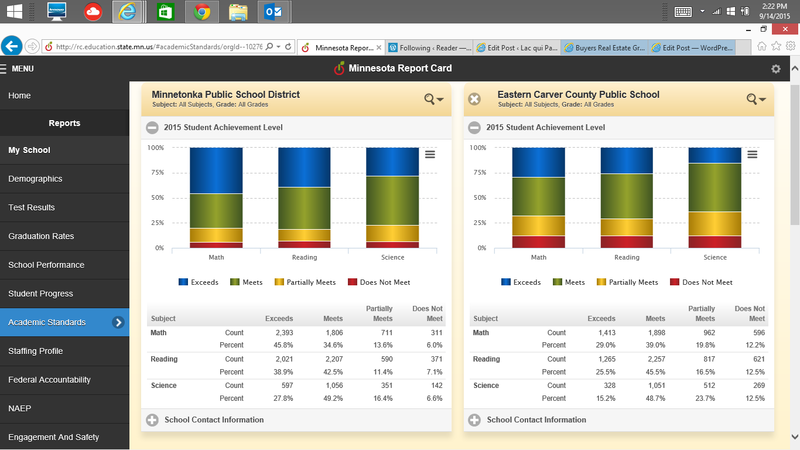 Two public school districts serve Chanhassen: Minnetonka District 276 and Eastern Carver County District 112. Below is a snapshot of how each school is doing. And there is a wide range of housing available. Call us to help you track down the right home for you!